Pedestal, pendant, and/or infrared remote control withchute/chute interchangeable remotes. The chute is a extremely ruggedly built, with heavy reinforcement on all sidewalls, lip walls, lip floor and pin connections. The lip pins are brass bushed and pinned, providing a zero-radius hinge— with no hinge crush point. The rockbox is designed to be cast directly into concrete—not simply anchored. This provides additional rock-box reinforcement in the area that it’s most needed. All liners are lapped over bolted joints, and bolted joints are all perpendicular to the muck flow. 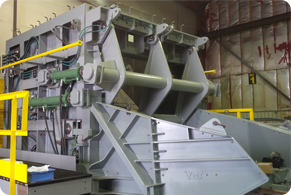 The Super Heavy Duty Chute is designed from the ground-up with a failsafe hydraulic system. 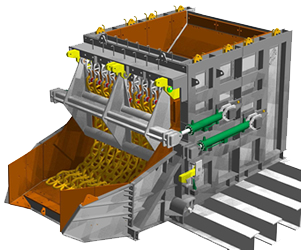 It includes side-mounted gate and lip cylinders, providing much safer maintenance access than traditional chute designs. The sidewall-mounted cylinder configuration eliminates the entire headblock assembly—a high maintenance area in traditional chute designs. The traditional sidewall extension plates are replaced by heavy sidewall extension liners which fit inside the main lip sidewalls. The provides better maintenance access, and eliminates a narrow bolted connection.